R2008, Patrick O'Connor. 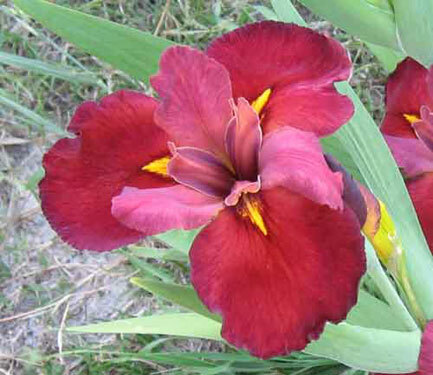 22", M. Falls deep, velvety red. Deep yellow orange arrowhead signal outlined deep red. Standards reddish but lighter. Style arms wine red. Good branching. Relatively large flower on a well branched, 22 inch stalk. Makes a showy clump. Zydeco x (Hurricane Colin x Sharon Juliette).